This Beautifully Decorated Terraza 1 Plan Home is Located in the Prestigious, Private Rancho La Quinta Country Club - Just 15 Minutes Away from the World Famous El Paseo Shopping Area and less than 10 Minutes Away from the La Quinta Resort and Spa and the Silver Rock Golf Club. Overlooking the 16th Fairway and Green of the Robert Trent Jones, Jr. Course, this Home Provides Expansive Views of the Santa Rosa Mountains and Golf Course. The Large Patio with its Full Range of new outdoor Furniture and Gas BBQ together with the Beautiful Pebble Tec Pool and Spa and Freshly painted exterior, is a Perfect Retreat for Casual Desert Living and Vacationing. The 2400 Sq. Ft. Home has been recently upgraded. Its new Living/Great Room Furniture, new Kitchen Appliances, Granite Counter Tops, Travertine Marble Floors, and Entertainment Center including a large flat Screen HDTV and DVR will Captivate You with Comfort and Luxury from the Moment You Arrive. Soaring Windows, High Ceilings and Glass Doors Create a Light and Airy Feeling to the Spacious Open Layout of the Living/Great Room and Kitchen. Rancho La Quinta Country Club's Impressive Grounds and Two Golf Courses Are Meticulously Manicured and Landscaped with Seasonal Flowers, Shrubs and Plenty of Palm and Fruit Trees. An added bonus is the all year round heated Resort Pool and Spa which is just a three minute walk from the Vacation Home. Look No More for Outstanding Value in a Beautiful Desert Luxury Home Within Minutes of All the Desert Valley's Best Offerings including a nearby Costco and Target Centre. The Refrigerator has an ice/water machine with filter. Recently updated and painted with new appliances. TV's are located in the Great Room and Master Bedroom. TV's in the spare bedrooms do not function, however guests can also use their personal devices with our Wifi for their entertainment options. Includes full range of Patio Furniture and Gas BBQ. Rancho La Quinta is a highly exclusive gated community ideally situated in the La Quinta area. We have stayed at this resort for the last 2 years. This home is an absolute jewel! With 3 bedrooms (all king beds) and one single bed in one of the guest bedrooms, it is ideally set for entertaining family and friends. The decor is beautiful, clean and uncluttered, with high ceilings, marble floors and a gourmet kitchen which lacks for nothing. The gas fireplace in the great room is a very welcome feature on some of those cool desert evenings. 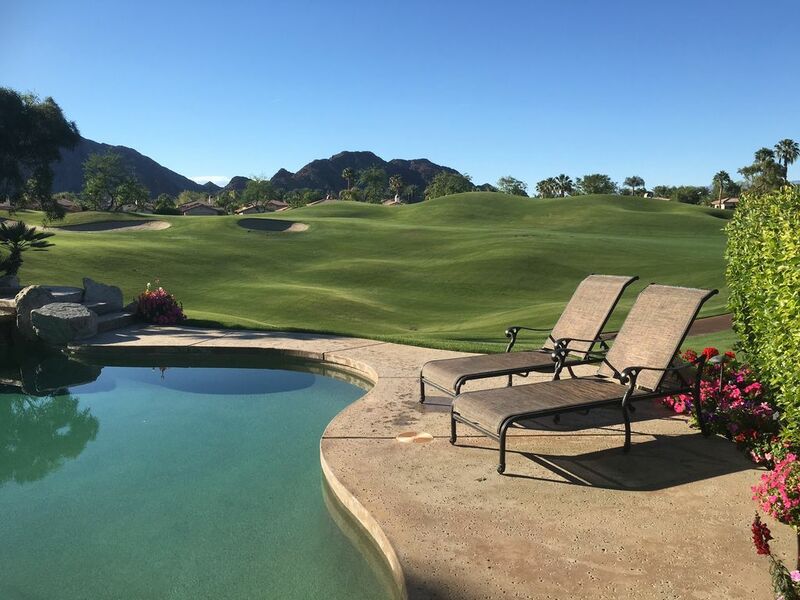 The pool/spa and patio are of an ideal size, with a spectacular view, looking over a fairway on one of the golf courses to the mountains beyond. The owners were a pleasure to deal with - honest, reliable and prompt. We were given an excellent orientation to the house when we arrived by the owner's agent who lived in the resort for many years - it was quite the best orientation to a rental property that we have ever had, and the agent was always quick to respond to any questions that we had during our stay. The northern exposure of this house is the preferred exposure in this resort as it protects from any winds and avoids the low late afternoon sun 'lasering' into the house! The location is excellent for shopping with Costco about 5 minutes away and Whole Foods, Bristol Farms and El Paseo Drive about 15 minutes. We can highly recommend this home without reservation - a true jewel! My husband and I enjoyed a wonderful stay. The home is beautiful with all the amenities you would get at a high end hotel. Everything was provided and we lacked for nothing. The home owner was very responsive to all communication and was involved and available for any inquiries. The on site manager was very good. The home is in a very central location to lots of golf courses, restaurants and shopping. It is a very secure gated community and it backs onto a beautiful golf course. We have rented in the desert for several years and this home was by far the best and very well maintained. I would highly recommend the house and the owners. We will definitely be back. From our first point of contact asking questions, the owner was fantastic. My wife and I and our two teenage boys had a fabulous vacation. The pictures of the house do not do it justice. The finishings in all the rooms and the amenities were those of a luxury resort. The pool, spa and the views from the backyard are spectacular. We used the house as our home base and visited San Diego, Los Angeles and played many wonderful local golf courses. The house is centrally located and allows for easy access to major highways, shopping, tourist attractions, restaurants and world class golf. I have already recommended this home to friends and I will continue to recommend this home to anyone looking for a family or multiple families vacation. My wife and I just returned from a fabulous 1 month stay at this lovely home in Rancho La Quinta. The accommodations were as beautiful as the weather. The 3 bedrooms each have their own private bathroom, the kitchen was well equipped, and the living room was spacious and comfortable with great mountain and golf course views. The outdoor pool and spa area is wonderful, with a BBQ, fire pit, many lounge chairs, and evening stars galore. We enjoyed walking the neighborhood several mornings, and were always greeted by friendly neighbors. Several great restaurants are within a few miles, as well as all of your shopping needs. We anticipate returning to this beautiful home next year, and would highly recommend it to anyone. The owner was great to work with, very prompt in answering our questions, and did everything he could to ensure all of our expectations were met. My husband and I stayed at this beautiful spacious home for extended time while we searched for a home in the area. This home has everything you would ever need whether for a week or several months. The spacious Great Room and kitchen with high ceilings and ceiling to floor windows open up to a beautiful huge patio with large pool and spa. It also has a gas BBQ and plenty of patio furniture! My husband and I are golfers so it was fun watching the golfers hit up onto the 16th green while sipping cocktails in the spa. This property also has a fax,scanner and printer available if you need it and wired for Wifi. This property is located near many fabulous restaurants you will especially enjoy Old Town La Quinta with many shops and outside cafés. I would recommend this property to families because it offers a home away from home where you can truly relax and enjoy all the amenities that this home offers! The owners go out of their way to make your stay special! Renting for a second time demonstrates that we are pleased with this rental! We have rented this property in 2009, tried to rent in 2011 but it was not available, and rented again in 2013. This is the best testimony that anyone can make to demonstrate that we are pleased with this rental. Any other superlative would be redundant! The property is clean and well kept. The renter's rep is on time and helpful. The pictures are accurate, “what you see is what you get”.